When Vista was released there was a lot of hype of the ReadyBoost feature in it which speeds up Vista when you plug in a USB drive and select “Speed up my system using Windows ReadyBoost” from the autoplay window. Since this feature wasn’t available on Windows XP some software developers developed a ready boost app for XP known as eBoostr which was similar to the Vista Ready Boost feature in Vista. Overall the performance of the Readyboost feature in Vista wasn’t quite satisfying. If you tried plugging in a pen drive you might have observed the difference wasn’t quite a lot. Well, now the question is how do we know whether the Vista Ready Boost feature is really working and how do we monitor its performance? If you plugged a pen drive and selected “Speed up my system using Windows ReadyBoost” you might have observed that the LED light on the pen drive keeps blinking from time to time. So how do we monitor the performance? It’s a tiny portable tool which is just 51KB in size. 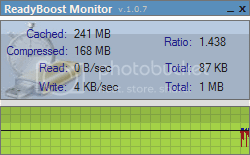 It can monitor the ReadyBoost read and write speed, the cache and compressed size. While running it can be minimized to the system tray. It represents the figures in terms of a small graph. This app is even smaller than the above one, its just 25KB. It’s interface is pretty simple and easy to understand. It shows ReadyBoost Hits, ReadyBoost Reads, Physical disk and the efficiency in percentage.